Cambridge, MA: MIT Press, 2004. First edition of the Canadian-born American architect’s book of architectural drawings. Octavo, original cloth, silver endpapers, illustrated. 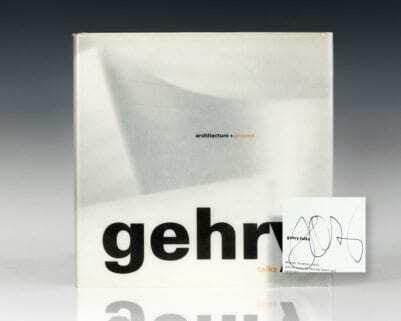 Inscribed by the author on the title page, “For William, Frank Gehry 2005.” Fine in a fine dust jacket. Essays by Horst Bredekamp, Rene Daalder, and Mark Rappolt. Commentary by Frank Gehry, Edwin Chan, and Craig Webb. Edited by Mark Rappolt and Robert Violette. Gehry Draws traces the architect's thinking through 32 major projects (both built and unbuilt) with more than 500 drawings (many of which have never before been published) and more than 400 additional illustrations -- providing a privileged view of the creative practice of a master architect. Horst Bredekamp's introduction relates Gehry's drawing methods to the concept of "disegno," as practiced by Leonardo and Durer -- not only the act of drawing and modeling but also the dynamics of creative thinking -- and shows how Gehry thinks through the curving movements of his hand on paper. Gehry himself describes for Bredekamp his method in several explanatory sketches, and Bredekamp applies this to a study of drawings made for specific Gehry commissions.Gehry Draws is produced in collaboration with Frank Gehry and his team at Gehry Partners. Project synopses and commentary by Gehry and two of his Partners and Project Designers, Edwin Chan and Craig Webb, guide us through the full range of Gehry production, from the small details of furniture design to such large-scale undertakings as the Disney Concert Hall and the Guggenheim Museum in Bilbao. The drawings, illustrations, and text in Gehry Draws definitively place drawing at the heart of Frank Gehry's creative process. FOG: Flowing in All Directions. Los Angeles: Circa Publications, 2003. First edition. Folio, Original illustrated boards. In fine condition. Signed and dated in 2005 by Frank Gehry on the front panel. First edition of this work on the architect Frank Gehry. Oblong quarto, original cloth, illustrated throughout. 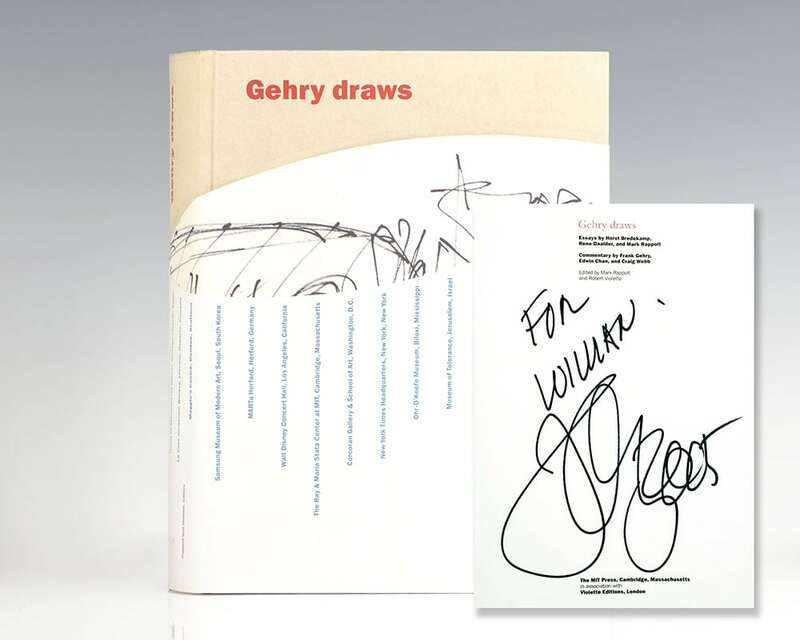 Signed by Frank Gehry on the title page. Fine in near fine dust jacket. New York: Guggenheim Museum, 1998. First edition. Quarto, original boards. Fine in fine dust jacket. Signed by Frank Gehry at the preface. Gehry, Frank O.; Francesco Dal Co; Kurt W. Forster. Frank O. Gehry: The Complete Works. First paperback edition. Quarto, original illustrated wrappers. In fine condition. Signed by Frank Gehry on the title page. Architecture + Process: Gehry Talks. First edition. Octavo, original illustrated wrappers. Signed by Frank Gehry on the title page. Illustrated and with commentary by Gehry throughout. First edition. Oblong quarto, original illustrated boards, illustrations throughout. Fine in a fine dust jacket. Signed by Frank Gehry on the title page. Edited by Mildred Friedman. Essay by Michael Sorkin. Commentary by Gehry throughout. Symphony: Frank Gehry’s Walt Disney Concert Hall. New York: Harry N. Abrams, 2003. First edition of this volume on Gehry’s Walt Disney Concert Hall in Los Angeles. Quarto, original cloth, illustrated throughout. Signed by Frank Gehry on the title page. Fine in a fine dust jacket. Preface by Deborah Borda. Introduction by Frank Gehry. With essays by Richard Koshalek and Dana Hutt, Carol McMichael Reese, Esa-Pekka Salonen and Michael Wood. Photography by Grant Mudford. New York : Sea Cliff Editions, 1985. 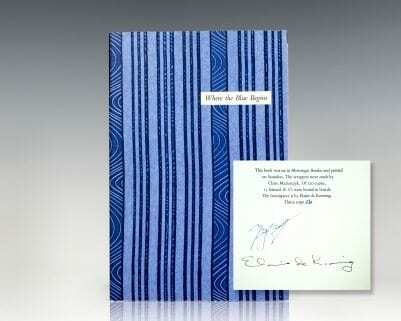 Signed limited first edition of American poet George Bradley’s Where the Blue Begins. One of only 120 numbered copies signed by George Bradley and abstract expressionist Elaine de Kooning. Quarto, original blue illustrated wrappers by Claire Maziarczyk. Original silkscreen frontispiece by Elaine de Kooning with loose rice paper tissue guard present. In fine condition. An excellent example. A Little Tour in France. Boston and New York: Houghton Mifflin Company, 1900. 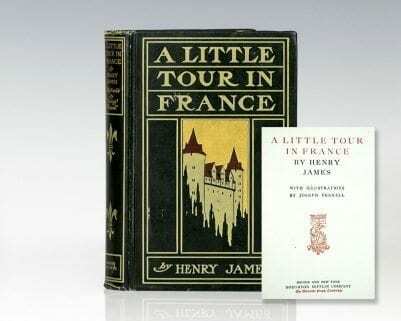 First illustrated edition of James’ classic account of his six-week tour to provincial France between 1883 and 1884. Octavo, original illustrated cloth, gilt titles and tooling to the spine and front panel, top edge gilt, frontispiece of Old Street, Dijon with tissue guard present. Illustrated by Joseph Pennell. In near fine condition with light rubbing to the crown and foot of the spine. A beautiful example. Portrait of George Washington after Gilbert Stuart, American School, late 19th century oil on canvas portrait of President George Washington, after the Athaneum portrait by Gilbert Stuart. Housed in a Victorian giltwood frame with floral carved corner ornaments and oval opening. The entire piece measures 35 inches by 40 inches. An exceptional piece. Tom Stoppard Original Signed Drawing. 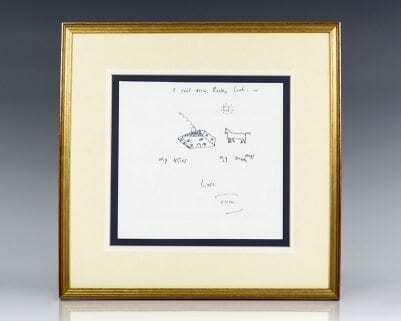 Original drawing by playwright Tom Stoppard. “I can’t draw. Really. Look: My Hous, My Dogg (crossed out and replaced with ‘Hors’) Love, Tom.” The drawing corresponds to one of Stoppard’s later plays, The Real Thing, first performed in 1982. Known for his use of playful language in addressing philosophical concepts, Stoppard’s later works sought greater emotional and interpersonal depths, as is also apparent in this lighthearted and intentionally naive portrayal of a scene typical of children’s art. Rare and desirable with an original drawing. The drawing measures 8.5 inches by 8 inches. Matted and framed. The entire piece measures 14 inches by 14 inches.